There was supposed to be four of us going up to the summit of Mauna Kea but two couldn’t play hookey from work so Joe and I headed up for adventure. 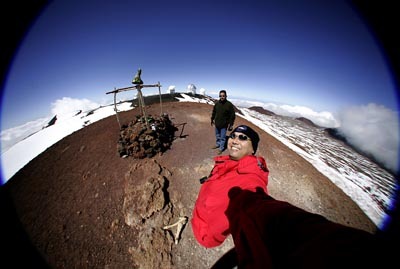 We were the only visitors on the summit for much of the time up there until a couple of vans filled with kids from Seabury Hall – Maui came up to play in the snow. 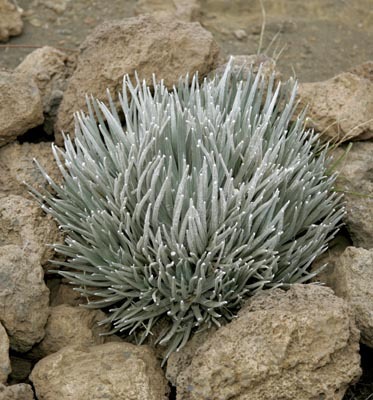 A silversword plant growing near the Ellison Onizuka visitor’s center. This rare plant grows here and on the summit of Haleakala on Maui. Me in red and Joe on the summit of Mauna Kea. 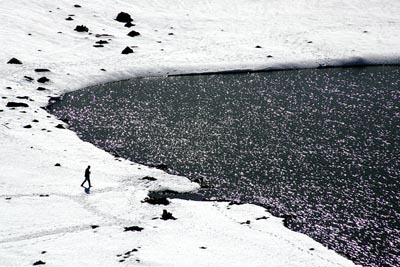 Joe headed over to Lake Waiau, I took a pass and stayed on the crater rim, I had been to the lake before and it’s an exhausting hike in the thin air. Plus I got to take some photos from him. I was hoping the lake would be frozen over but it’s been a couple weeks since the last good snowfall and the weather has been too clear to stay cold. 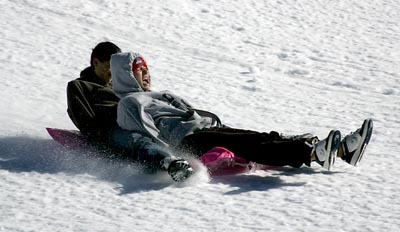 Kids from Seabury Hall go sledding down a cinder cone with an air mattress. 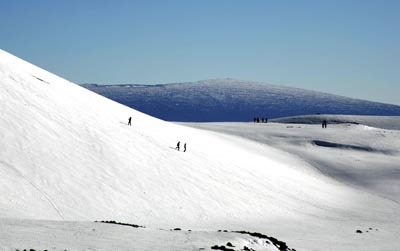 The kids romping around the cinder cone and heading for Lake Waiau, the summit of Mauna Loa is off in the distance. It was a beautiful day up there. 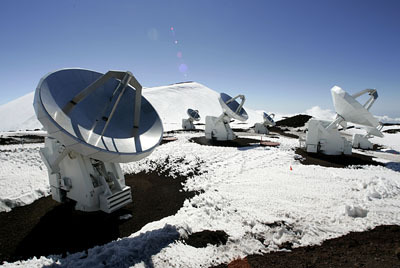 The submillimeter array on Mauna Kea. 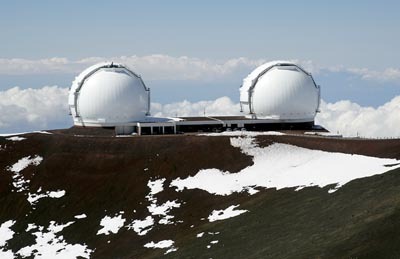 The twin domes of Keck I & II observatory. Previous PostPrevious We’re 1st Place! Amongst the losers.